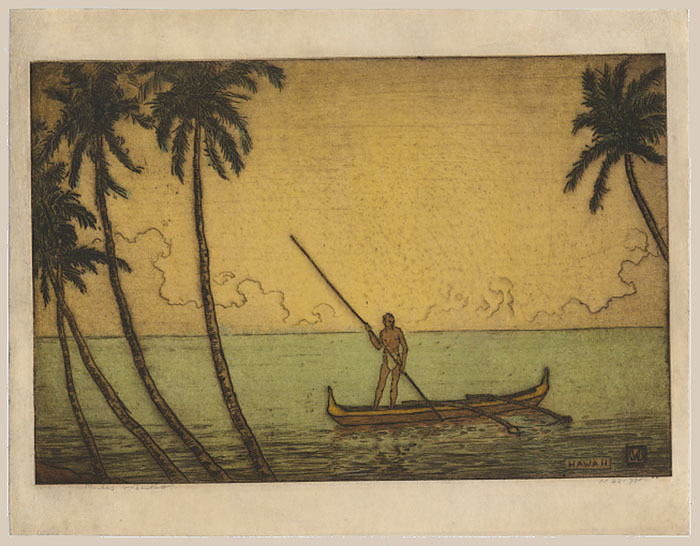 Bartlett, Charles (1860 - 1940), "Hawaii (Man in Outrigger, Hawaii)"
Notes: Signed and numbered in graphite by the artist. "CWB" monogram and title in plate. As stated by Miles, "The rare and rarely seen hand-colored etchings can now take their deserved place as Bartlett's collective masterwork". Born in England, in 1860, Charles W. Bartlett studied metallurgy and worked in that field for several years before entering the Royal Academy of Arts, London in 1883. After three years of study, he entered the Academie Julian in Paris. Returning to England in 1889, he then traveled to Brittany and Italy with his friend Frank Brangwyn creating watercolor works. In 1913, he traveled to Asia with his wife, visiting India, Pakistan and Sri Lanka before arriving in Japan, via China, in the autumn of 1915. Bartlett visited the Watanabe Print Shop with sketches and watercolors from his journey and in 1916 Watanabe produced 21 prints from the Bartlett paintings. Bartlett left Japan in 1917, on his way to England via Hawaii. He stopped in Honolulu and ended up setling there for the rest of his life. His paintings and woodblock prints were well received in Honolulu and Bartlett quickly became an important figure in the local art world. He returned to Japan in 1919, where Watanabe published 16 works including Hawaiian subjects. Charles W. Bartlett held a number of one-man shows in Hawaii and the U.S. mainland, and his painting and prints were published in Paradise of the Pacific magazine. In 1933 he established the Honolulu Print Makers. A retrospective exhibition was mounted at the Honolulu Academy of Arts in 1939, and he passed away in April of 1940.